Choosing a summer camp can be daunting for any parent, of any child, especially if you’re exploring your options for the first time. Doubly so if your child has special needs. Just as when you may have navigated the IEP process, you’ll need to advocate for your child to ensure his or her needs will be addressed while at camp. It’s an integral part of the selection process. Before you get to that point, though, you should define your own criteria. After all, you’ll be entrusting your child to people for a significant amount of time. As a starting point, look inward and ask yourself some basic questions: What are your preferences and needs in terms of budget? Geography? Camp size? Religious affiliation? Do you want your child in a more mainstream environment? Or one that’s mostly geared toward special-needs? How would you and your child define a successful summer camp experience? By narrowing the list of realistic possibilities, you can research the finalists in greater depth. Basic statistics: Ask about the ratio of campers to staff members. What training is required? How many have relevant certifications? What’s the maximum camper population? How often do campers end up going home early—and why? About the staff: Ask how staff deals with problem behavior—including when a child feels bullied or picked on. Is there a formal discipline system? Ask about the medical staff, their level of relevant experience and training, and their availability. Is there a particular and trusted staff member your child can turn to if needed? About daily life and routines: Ask about the way activities are structured on a typical day. How do they adjust when weather turns nasty? How much time do kids have to do their own thing? What kinds of off-campus excursions are available? Do they offer academics to bridge the gap between school years? Ask about typical meals. Ask about safety and accident prevention protocols. About accommodations for special-needs: Ask if the camp has experience with other kids who have similar issues. What specific accommodations and assistive technology are available? What efforts will the camp make to help your child fit in socially and feel welcome? If relevant, ask where the nearest acute-care hospital is located. About parental involvement: Ask how they handle visits from parents and siblings. Can you take the child off-campus? Can you volunteer and observe? To round out your research, don’t hesitate to ask detailed follow-up questions if you feel the need. You and your child may also want to speak with parents and kids who have direct experience with the camp(s) you’re considering. Once you’ve made your decision, stay in close touch with officials at the camp before, during and after the summer session. Take maximum advantage of visiting opportunities. You may need to navigate some perfectly normal separation anxiety—on your part as well as your child’s. Above all: create space for your child to develop independence, growth, pride, social skills and the joy of play. 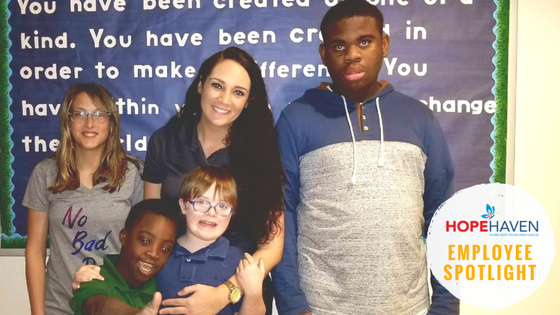 To learn more about Hope Haven and our summer camp programs designed for special-needs kids, or to schedule a tour, call us at 904.346.5100. Transitional life stressors like birth, death and moving are pretty normal. In addition, parents are subject to the inherent chronic stressors of parenting. Parental psychological stressors are related to the worries that parents have about the physical safety and the growth and development of their children. When a child has special needs, all of the attention is focused on helping the child. But parents also need assistance in coping with stress, their own feelings and frustrations. Think it through rationally, one step at a time. Describe the problem, including best- and worst-case scenarios. Separate the outside stressors you can control from those you can’t. Write down solutions and the steps needed to implement them. This process will help you feel empowered and focused. Manage your time. List your priorities in order of importance and compare them with how much time you’ve been allocating. You’ll see what issues are receiving too much or too little attention, so you can consciously make adjustments. Implement changes kindly and firmly. Assert and advocate for yourself and your child in a loving, respectful way. Learn to place limits or say no if too much is being asked of you. Be open to compromise if you feel it’s warranted, but avoid getting stuck in an indecision loop that feeds your stress. Learn about your child’s diagnosis. Base your reaction on information, not fear. Get an evaluation, then seek educational options and support groups, along with assistive and adaptive technologies that can help. Be positive with yourself. Repeat affirmations as often as needed. Remind yourself of your own good qualities and your value in all your roles—as a person, family member, caregiver, coach. Be realistic. No one can possibly take responsibility for all the tasks you probably assign exclusively to yourself. Learn to live with imperfection and uncertainty. Cut yourself some slack without criticizing yourself for not meeting unachievable standards. Expect constant change from yourself and those around you. Because stuff just happens sometimes. Chill. Downtime is essential. Are you getting enough rest? Most adults need six to eight hours of sleep. Take power naps when needed if possible. Try a few yoga postures or even some meditation if those work for you. Get some exercise. Go for walks together or separately. Hit the gym. Or swim some laps. The endorphins will help keep you feeling calm and empowered, and you’ll burn calories as intended. Limit screen time for yourself and your kids. Play. It’s distracting, and it helps you not focus on all the negativity that can lead to stress. Join a league. Kick a soccer ball. Hang out with the pets. Take the dog to a dog park. Eat right. Do more cooking and less eating out. Especially if your choices have included too much unhealthy fast food. Eat dinner together as a family as often as possible. Meal prep is often a bonding experience. Though stress is a normal and natural response to perceived threats, it doesn’t have to rule your life. Especially in challenging times. By taking the initiative to recognize triggers and deploy coping strategies, you can improve the quality of life for yourself and your child. For more information, contact us at 904-346-5100. To learn more about our services for special-needs children and their families, schedule a tour of Hope Haven. Our friends at MangoSoul Productions sat down with some of our young adults with Down syndrome talk to us about happiness… How would you define happiness?